Anatomy and physiology students excel thanks to Carolina Distance Learning® lab kits. “In 2014, we began completely redesigning our Anatomy and Physiology I and II courses, from the textbook to labs and everything in between,” explains Jana Herron of Chattanooga State Community College. That redesign started with the online sections of the courses, with Herron as the designer. The head of the Life Sciences Department suggested Herron investigate the Carolina Distance Learning™ lab kits to see if they would be appropriate for the course curriculum. “When Herron began exploring the kits, she had a few key criteria in mind, including high-quality materials, effective instructions, and excellent customer support for both her and her students. What she found exceeded her expectations. The Carolina Distance Learning® Build Your Own Anatomy & Physiology Kit that Herron received was first of all “very well organized and packaged.” When she began experimenting with the individual kit activities, Herron found the equipment and materials to be of high quality. She was pleased that each dissection specimen came with its own dissection kit containing a dissection tray, absorbent pad, and self-locking storage bag. “The quality of the materials helped make the experiments easy to conduct,” says Herron. Herron was especially struck with the quality of the dissection specimens. She found them very well preserved and prepared, with good color and texture. “The Carolina’s Perfect Solution® storage medium really maintains the specimens in excellent condition,” says Herron. Students are often nervous about making mistakes in dissection labs. Recognizing this, Carolina includes detailed, easy-to-follow instructions with its dissection specimens to guide students through each step of the dissection. The specimens also come with a poster that shows students what to do and look for during key steps of the dissection. Herron was very impressed with the quality of the instructions and poster. “The poster is a very high-quality graphic guide, and it’s included in the very reasonable price of the specimen kit,” she says. 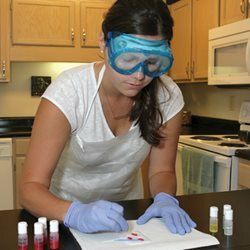 As Herron customized a lab kit to match her course curriculum, her Carolina Distance Learning® liaison, Stephanie Songer, answered Herron’s questions about specific lab activities and class-specific needs. “Stephanie and the Carolina customer service team provide outstanding support,” she reports. When Herron finalized her Build Your Own Anatomy & Physiology Kit, Stephanie set up a class-specific URL that students used to order their kits. “This ensured the student ordered the kit specifically designed for their class,” says Herron. Carolina quickly responded to questions and needs throughout the semester, such as when a student or instructor needed additional materials. This was especially helpful to Herron in her role as the Distance Learning Coordinator for all of the Life Sciences Department’s online classes. The quality of the instructional materials can make a big difference in student learning and success. Herron is very pleased with the positive student feedback on the lab kit, as well as the students’ academic success. Herron compared the grades achieved by online students to those of students in on-campus classes. She was gratified to see that the online students achieved the same high level of success as on-campus students did. The college’s newly designed online anatomy and physiology courses have been a resounding success for students and faculty alike.